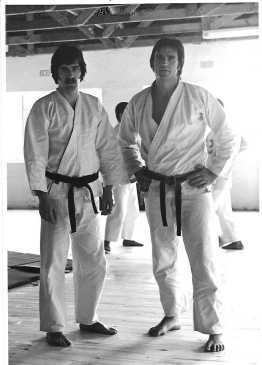 I started training in Dunfermline in March 1967, under brown belt Dave Mackie, whose organisation was called the Obikai Karate Renmie. (I was not aware of the style but probably was Shukokai from Tommy Morris Sensei or under Al Doran). After six months Dave emigrated but arranged for John Webster, Nidan (Chito-Ryu) to take over the club. 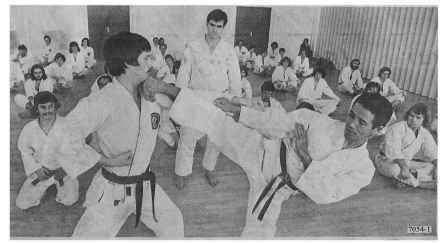 Webster added Shotokan kata to our syllabus and I reached 1st Kyu before he emigrated to Rhodesia in 1969 or 70. (When I was flying between tournaments in South Africa in 1976, l heard from a fellow passenger that he was still teaching at that time, and was still as fond of push-ups). The Dunfermline club split, with Jim Wood (today he is chief instructor East of Scotland Shotokan) continuing with Chito-Ryu while Jim Higgins and I, with a few others, formed Dunfermline Carnegie Karate Club. Later, after an introduction by Jimmy Johnstone (Glenrothes), we joined the British Karate Federation, led by Sensei Vernon Bell, Sandan and trained in Yoseikan (Shotokan). Jim Higgins and I took our Shodan with Vernon in May 1971. Jim later had an unfortunate experience after defeating tournament favourite Ticky Donovan, at the 1974 BKCC championships. I am sure he never again turned his back on an opponent to celebrate a cheeky, bout winning mawashi geri. In September 1971, I moved south to Havant, near Portsmouth and opened a club in Leigh Park. Among the earliest students was Steve Thomson. We had training visits from Sensei Bell, with Yoseikan karate classes often led by a young shodan, Paul Masters, while Vernon usually taught Jui Jitsu. Vernon was usually late and on one occasion, he arrived at my home so late that Paul and I had to rush off to the training, leaving him alone with the lunch prepared for all of us (five, including my wife). On our return, we found Vernon fast asleep in an armchair, and not one scrap of food left! As part of my Nidan requirement, I had to revive students knocked out by Vernon using a Japanese system called Katsui. (One of those areas of knowledge which needs huge amounts of study or is best left alone – I leave it alone). After Endo Sensei stopped visiting, I trained with Sensei Steve Morris for a couple of months. I used to travel from Havant to his Seven Dials, London dojo once a week, with one or two of my brown belts. This went well until one of them, Mike, who liked to display his Shukokai knowledge, decided he could teach Sensei Morris about gedan barai. He persisted after being told to shut up and was lucky to leave intact! I visited on my own for a few weeks but the relationship was never the same. A lesson – the instructor is responsible for his student’s behaviour. Brian Hammond (ex BKF) introduced me to Sensei James and his brother Peter at the 1974 British Karate Control Commission championships in Manchester. We arranged the first course taught in England by Sensei James in Chichester where he was assisted by Peter, who was Sandan. Sensei James invited Bob Greenhalgh and Tony Christian to this course. I trained every second weekend with Sensie James for a number months before he returned to South Africa. These sessions were often held in his front room in Wallingford except one time when we planted a Makiwara in his garden. Sensei Jame brought Sensei Chinen, then 6th Dan, to the UK in January 1975, then on to South Africa (below). During his stay in Wallingford, a neighbour complained about the incescant pounding on the makiwara! Sensei Chinen and Sensei James held a Gasshuku at my new Waterlooville, Hampshire dojo. This was well attended by other local Goju Ryu instructors including Mike Lambert and Mark Bishop. In the picture are George Andrews (London), and Brian Taylor (Liverpool). We held a local club tournament and demonstration in the evening, which was won by Havant, with Isle of Wight “A” second. Sensei Bell attended as we were discussing a merger which never happened. Shortly after we formed the British Goju-Ryu Karate Association. Tony Christian, Bob Greenhalgh and I attended this two week Gasshuku in Sensei James’ famous Fox St, Johannesburg dojo where Sensei Chinen taught a very physical gasshuku – perhaps a test of our determination – but an amazing experience. We competed against a South African team at their championships and I got our only point with a draw against Franz Bronkhorst. One highlight was a weekend trip to the Kruger Park, and another was Sensei Chinen’s Korean beef on the barbecue. Among the instructors I became friends with was Sensei Arnold De Beer, who features strongly in my story. Senseis Suzuki and Peter Rousseau took the course, which was held in Mike Lambert’s Ryde dojo. George Andrews, Tony Christian, Bob Greenhalgh and I were succesful in our Shodan tests. Another highlight was the shime demonstration where Suzuki Sensei broke a 2×2 across George Andrews shoulder and where I had been provided with an aluminium arrow to push into his throat till it breaks – a lot easier with wooded arrows! (Don’t try it – it is even dangerous when you know the “trick”). The photo was taken in Sensei Jame’s Walkerville dojo, March 1976. (I look knackered, but Higaonna Sensei and Chinen Sensei are still training in the background!) The dojo was not quite complete, and the floor had only been rough sanded. Higaonna Sensei decided that a couple of hours of tai sabaki (body shifting – sliding your feet on the floor), would improve the surface. It was also memorable to sleep on the dojo floor with Nanku Menai (then 6th Dan), and Uehara (brother of Kanco Ko Uehara) from Okinawa and Tadano, Arai, and Terauchi from Higaonna Sensei’s Yoyogi dojo along with Peter Harms (Belgium) and his student, Mike. Sensei Kagawa from the Goju-Kai in Tokyo also visited and acted as an advisor. We fought four tournaments against the Japanese team and the South African provinces in Cape Town, Bloemfontein, Johannesburg and Pretoria. I fought Terauchi in the first three contests, and he won them all. However, in the last fight, I accidently hit him above the eye, so he had to go for stitches. I won my last fight against Tadano, but this was on his disqualification. He enjoyed telling this story when we met in subsequent years! I was succesful in my Nidan test while Steve and Mick gained their Shodans. This was the Gasshuku at which the IOGKF was formed. It was led by Senseis Higaonna, Chinen and Rousseau. There was a large group of giant South African black belts. Steve Thomson gained fame from beer drinking upside down and from his soda syphon antics at the Medieval Banquet at Rhinefield House. When I moved to Kintbury in 1977, Berkshire I taught in Waterlooville and Oxford once a week (Sensie James had returned to South Africa, and his Oxford dojo was now run by Paul Coleman). I then opened Tilehurst, Reading in 1980, and also taught in Henley. The Wokingham dojo was opened in 1984. The Okinawan Gasshuku of 1981 represented, for me, the high point of my time with the IOGKF as almost every high ranked Okinawan Goju-Ryu instructor in Okinawa was involved. Sensei James tested for his 6th Dan. At our visit to the Jundokan, Bill Cuzzocrea was invited by Sensei Miyazato to try to move him out of his Sanchin, and found it impossible. This famous dojo has a special magic. This was another incredible Gasshuku, taken by Senseis Higaonna, Chinen and Rousseau. I was very fit and felt ready to take Yondan until I tore the muscles in my shoulder, when messing around with Henni De Vries (Namibia chief instructor). Sensie Backies Laubscher had prepared a very full agenda and had invented a four way makiwara, which worked well with four people, but probably could have been replaced with a concrete block, for all the “give” it had. It was at this Gasshuku that I met Henrieheta, who was a student of Sensei Arnold De Beer and she won her Shodan at this Gasshuku. This Gasshuku and tournament was a lot of fun, Henrieheta was keen to go for a run some mornings. Sensei Arnold De Beer and I shared the first &half; mile or so with her, then we had to stop, overlooking the sea, to practise some senior Sanchin and Tai Chi, till she returned. She won third place in ladies black belt kata during the world championships. I also met Pat McCarthy again, he is a famous martial arts author and teacher. We both did our early training under John Webster (Chito-Ryu), as we discovered on meeting in Okinawa in 1981, although Pat trained with John Webster before John came to Scotland. Arnold, Henri and I re-visited the Jundokan but were not invited to train this time as relations with the IOGKF were not at their best. Henrieheta was successful in her third Dan black belt grading in Higaonna Sensei’s dojo, where the high temperature and confined space was really tough on those taking their tests. (Peter Ubrecker from Australia was among those testing). Sensei George Andrews, Sensei Ernie Molyneux and I assisted Higaonna Sensei at this gasshuku, at the end of which Sensei Ernie and I were succesful in our Godan tests. Sensei James had taken a back seat from teaching as he built his Chiropractic business and the EGKA was being run by Sensei George Andrews, Sensei Ernie Molyneux and myself. The inevitable tensions led to a split and the formation of the GKI.